Thanks to Lyndsey of Josey Baking Company for supplying beautiful bread to top off our dining room design! Modern Sunburst wall mirror on glazed wall hangs between two brass lamps with grey linen shades by Robert Abbey. 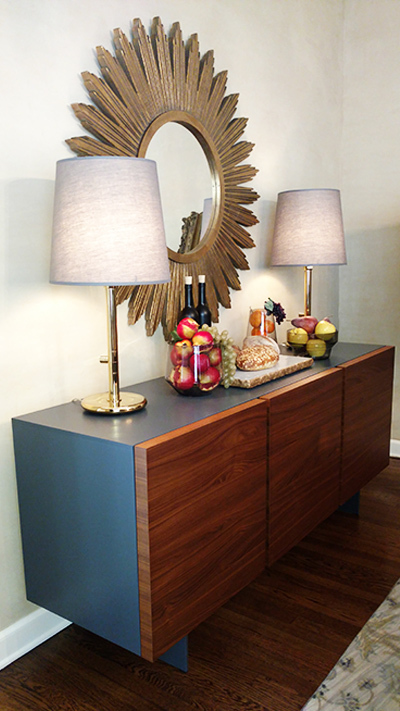 Italian contemporary Sipario Sideboard by Calligaris features lacquered matte grey casing with adjustable walnut doors. Marble slab thanks to Heartland Granite. This entry was posted in SohoNews. Bookmark the permalink.